Snow Peak Titanium Cook 'N Save is perfect for backpackers and travelers on the go. 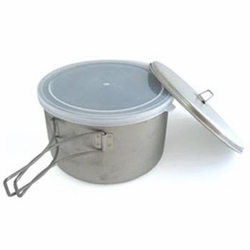 It includes a 2 quart pot, food grade polyethylene lid and titanium cooking lid. The entire set weighs in at under 9 ounces!